TODAY for a fast Quote! When was the last time you cleaned your oriental rug? I don’t mean vacuumed or spot cleaned. I mean had your oriental rug picked up and thoroughly professionally cleaned? If you haven’t had it professionally cleaned recently, you need to know that your oriental rug is able to hold its weight in soil BEFORE it is visible from the surface. Carpets and Oriental Rugs are often forgotten when it comes to deep cleaning because they look just fine. Rugs are designed to reflect light and hide soils. The reality is that your oriental rug might be overdue for a good, thorough professional cleaning. While they might look fine, many rugs are made using wool fibers that are great at trapping dust, dirt and abrasive soils that can damage the beautiful wool fibers or the cotton base fibers which hold your rug together. Vacuuming alone will not remove these abrasive soils that become trapped in the weave of your once beautiful oriental rug, but will only remove the loose soils on the surface of the fibers. But how do you clean an oriental rug? For many small, synthetic, unbacked rugs you can machine wash them on gentle. Just check the label and make sure to dry it on a drying rack to preserve its shape. 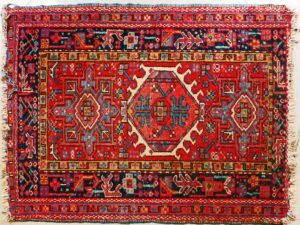 However, if you have a hand knotted Oriental Rug, a custom carved rug, or a rug made with animal fur, it is best to leave the cleaning to the pros. Unlike their synthetic counterparts, oriental and specialty rugs can be made from delicate natural materials such as silk, wool or cotton, requiring special chemicals and care when cleaning. If cleaned improperly, specialty rugs can warp, shrink, or lose the integrity of their colors. Steam cleaning, for instance, can easily damage the dyes in your rug causing the colors to bleed and the fibers to shrink, causing irreparable damage to your rug. Quality rugs are an expensive investment, you want to make sure you protect and care for them properly. That’s where we come in! Big Red’s Guaranteed Clean is here to clean and maintain your beautiful Oriental and Specialty Rugs. Located right in Omaha, our business is taking care of rugs and we’ve developed a specific process to do just that. The most important part of our process is the special care we take in processing each and every rug. It’s not only our business, but our passion, to make sure your rugs receive the absolute best care. Before any cleaning, we do a thorough pre-inspection to make sure we know exactly the current state of your rug, the fibers we are dealing with, and the construction of your rug. All of these things are extremely important to choose the right method of cleaning and the exact treatments needed to restore your rug to like-new condition. We also include a detailed list of the services we will perform along with an exact Guaranteed Price Quote that will be e-mailed to you prior to starting any work on your rug. After our inspection, and your approval, we will “dust” your rug. This is the process of removing dry soils from your rug. We use a combination of methods and our proprietary tools to blow compressed air through the backing of the rug, removing the finest of soils. The accumulated fine dust must be removed or it will turn to mud once it’s mixed with water. Dye bleed testing is also completed before water touches your rug to make sure it comes out clean and beautiful. Only after we have systematically inspected and protected your rug will we begin the wet cleaning steps to thoroughly hand wash your rug. It is at this point we apply Dye Stabilizer as required, along with pet acid and enzyme treatments. After all of the pre-conditioning, we place your rug in our exclusive “Gentle River Wash”. This wash is a mixture of safe detergents, gentle agitation, and compressed air to thoroughly deep clean your rug from the tips of the fibers to the backing and then completely rinsed until the water runs clear. Your rug is then dried completely in our climate-controlled drying room. After drying, the fringes are cleaned and final touch-up and grooming of the fibers are completed. The last step in our rug cleaning process is a final manager inspection by “the pickiest man in the world” – that is the nickname my guys have given me over the years. We make sure your rug doesn’t leave our facility unless it is in perfect condition, including wrapping and sealing for handling or storage. Why do you want to have your rug cleaned by “the pickiest man in the world”? Entrusting your rug to Big Red’s Guaranteed Clean means your rug is in safe and knowledgeable hands. As a business, we take your rug and investment seriously and we personally make sure it is cleaned and cared for to the highest standard. By bringing your rug to us, you’re bringing your rug to the only Certified Master Rug Cleaner in the state and keeping your business with a local, caring Omaha company with 33+ years of experience. Contact us today to discuss a rug cleaning with FREE pick-up and delivery!